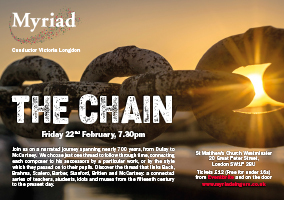 Myriad stage a narrated journey spanning nearly 700 years, from Dufay to McCartney. We choose just one thread to follow through time, connecting each composer to his successors by a particular work, or by the style which they passed on to their pupils. Discover the thread that links Bach, Gounod, Brahms, Scalero, Barber, Stanford, Britten and McCartney: a connected series of teachers, students, idols and muses from the fifteenth century to the present day. 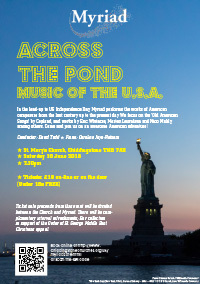 In the lead-up to US Independence Day, Myriad performs the works of American composers from the last century up to the present day. We focus on the ‘Old American Songs’ by Copland, and works by Eric Whitacre, Morten Lauridsen and Nico Muhly, among others. Come and join us on an awesome American adventure! 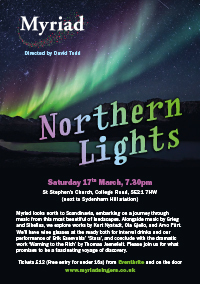 Myriad looks north to Scandinavia, embarking on a journey through music from this most beautiful of landscapes. Alongside music by Grieg and Sibelius, we explore works by Kurt Nystedt, Ola Gjeilo, and Arvo Pärt. We’ll have wine glasses at the ready both for interval drinks and our performance of Erik Esenvalds’ ‘Stars’, and conclude with the dramatic work ‘Warning to the Rich’ by Thomas Jennefelt. Please join us for what promises to be a fascinating voyage of discovery. 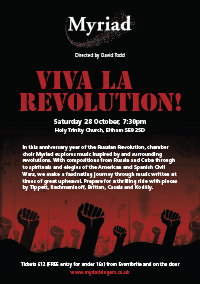 In this anniversary year of the Russian Revolution, chamber choir Myriad explores music inspired by and surrounding revolutions. With compositions from Russia and Cuba through to spirituals and elegies of the American and Spanish Civil Wars, we make a fascinating journey through music written at times of great upheaval. Prepare for a thrilling ride with pieces by Tippett, Rachmaninoff, Britten, Casals and Kodály. A seasonal offering of music and poetry around the theme of love. 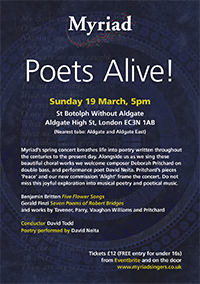 Myriad’s spring concert breathed life into poetry written throughout the centuries, right up to the present day. Alongside the choir we welcomed composer Deborah Pritchard on double bass and performance poet David Neita. 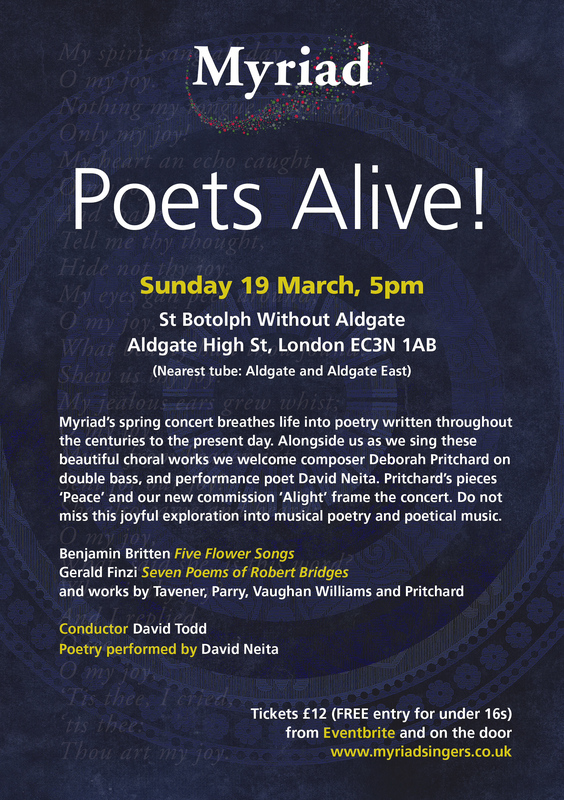 Pritchard’s pieces ‘Peace’ and Myriad’s new commission ‘Alight’ framed the concert. A commemoration of the Great Fire of London 1666. 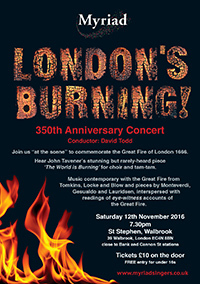 Works included John Tavener’s stunning but rarely-heard piece ‘The World is Burning’ for choir and tam-tam and music contemporary with the Great Fire from Tomkins, Locke and Blow and pieces by Monteverdi, Gesualdo and Lauridsen. The concert was interspersed with readings of eye-witness accounts of the Great Fire. 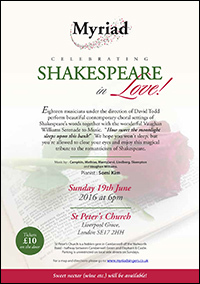 A performance of beautiful contemporary settings of Shakespeare’s words. Works included Vaughan Williams ‘Serenade to Music’ alongside pieces by Campkin, Mathias, Mäntyjärvi, Lindberg and Skempton. Sacred and Secular Choral Music of the French High Renaissance was performed by Myriad under the direction of Ghislaine Morgan. The concert featured works by Le Jeune, Sermisy and Josquin amongst others and took place at 7pm on Saturday 28 February 2015 at St Peter’s Church, Liverpool Grove, Walworth. The inspiration for this concert came from the wealth of beautiful choral music composed about the Archangels and the themes with which they have each become associated. With each theme, motifs were chosen that best evoked the spirit of the Archangel.